The school district previously took down LGBTQ-supportive signs from a middle school, but stands by the posters promoting a high school club. A Missouri father who tore down posters for a Gay-Straight Alliance from his local high school’s walls complained to the Columbia Board of Education this week and accused the club of inappropriately pushing a conversation at school that parents should have at home. “I think that just like certain other topics, such as religion and Christianity, that perhaps the school, in and of itself, should not be the proper place for this conversation,” Ken Allen told the school board, according to local ABC affiliate KMIZ. One of the hand-drawn posters in question shows a number of hands reaching together toward a heart. The hands bear words like “transgender,” “pansexual,” “nonbinary” and “gay” and are shaded with the appropriate colors of flags for those groups. Columbia Pubic Schools spokeswoman Michelle Baumstark, however, said the posters do not violate the law and promote an official club. She said the Allen family has incorrectly cited a law requiring the district to notify parents of any “human sexuality instruction” and allowing parents to opt their own children out of such education. 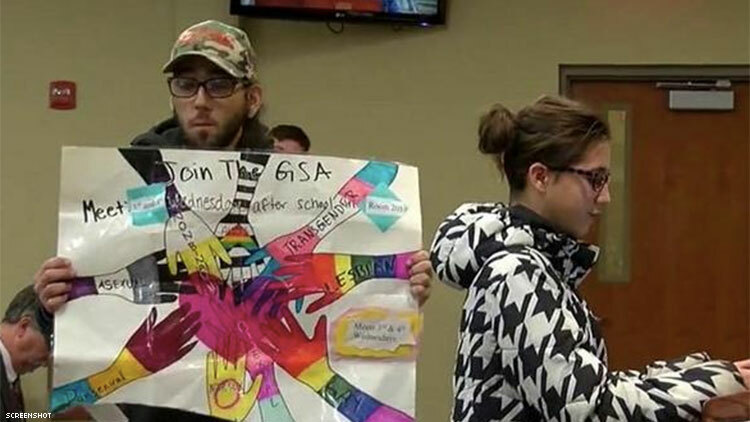 But the school district has taken action against GSA posters before, the news station reports. In October, the district tore down LGBT History posters from a local middle school after parents complained the materials promoted certain sexualities. Baumstark said then posters promoting the middle school’s GSA club could stay up, but those simply identifying celebrities who identify as LGBTQ would not remain.